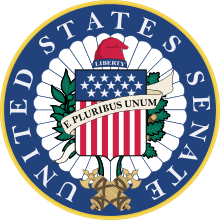 The three classes of United States Senators are made up of 33 or 34 Senate seats each. The purpose of the classes is to determine which Senate seats will be up for election in a given year. The three groups are staggered so that one of them is up for election every two years, rather than having all 100 seats up for election at once. For example, the 33 Senate seats of Class 1 were elected in 2012, the 33 seats of Class 2 were up for election in 2014, and the 34 seats of Class 3 were up for election in 2016. A senator's description as junior or senior senator is not related to his or her class. Rather, a state's senior senator is the one with the greater seniority in the Senate. This is mostly based on length of service. When the Founding Fathers agreed to give six-year terms to Senators, they also decided to stagger the elections, so that a third of the Senate was up for election every two years. With this staggered turnover, the Founding Fathers wanted to ensure stability in the Senate, and encourage Senators to deliberate measures over time, rather than risk a rapid turnover of the entire chamber every six years. At the same time, they wanted more frequent elections, as opposed to waiting every six years, to prevent Senators from permanently combining for "sinister purposes". Immediately after they shall be assembled in Consequence of the first Election, they shall be divided as equally as may be into three Classes. The Seats of the Senators of the first Class shall be vacated at the Expiration of the second Year, of the second Class at the Expiration of the fourth Year, and of the third Class at the Expiration of the sixth Year, so that one third may be chosen every second Year. And the third of Mr. Dalton, Mr. Ellsworth, Mr. Elmer, Mr. Maclay, Mr. Read, Mr. Carroll, and Mr. Grayson. That three papers of an equal size, numbered 1, 2, and 3, be, by the Secretary, rolled up and put into a box, and drawn by Mr. Langdon, Mr. Wingate, and Mr. Dalton, in behalf of the respective classes in which each of them are placed; and that the classes shall vacate their seats in the Senate according to the order of numbers drawn for them, beginning with number one: And that, when Senators shall take their seats from States that have not yet appointed Senators, they shall be placed by lot in the foregoing classes, but in such manner as shall keep the classes as nearly equal as may be in numbers. On the following day, May 15, the term expiration of each class was determined by drawing lots. Lot No. 1, drawn by Mr. Dalton, contained Mr. Dalton, Mr. Ellsworth, Mr. Elmer, Mr. Maclay, Mr. Read, Mr. Carroll, and Mr. Grayson, whose seats shall, accordingly, be vacated in the Senate, at the expiration of the second year. Lot No. 2, drawn by Mr. Wingate, contained Mr. Wingate, Mr. Strong, Mr. Paterson, Mr. Bassett, Mr. Lee, Mr. Butler, and Mr. Few, whose seats shall, accordingly be vacated in the Senate, at the expiration of the fourth year. Lot No. 3, drawn by Mr. Langdon, contained Mr. Langdon, Mr. Johnson, Mr. Morris, Mr. Henry, Mr. Izard, and Mr. Gunn, whose seats shall, accordingly, be vacated in the Senate, at the expiration of the sixth year. Upon the expiration of a senator's term of any length, someone starts a new six-year term as senator (based on election by the state legislatures until the Seventeenth Amendment required direct popular election of Senators). 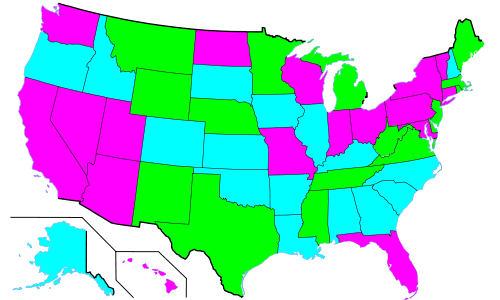 Because each state is represented by two Senators, regardless of population, each Senate class collectively represents a different number of people than each other Senate class. Since the early 19th century, Class 2 Senators have cumulatively represented between 50-60% of the population of the United States, while Senators from each of the other two classes have cumulatively represented approximately 70-75% of the population of the United States. When a new state is admitted to the Union, its two senators have terms that correspond to those of two different classes, among the three classes defined below. Which two classes is determined by a scheme that keeps the three classes as close to the same size as possible; one that avoids the largest class differing by more than one senator from the smallest class. A coin toss determines which new senator enters which of the classes selected to be expanded. This means at least one of any new state's first pair of senators has a term of less than six years, and one term is either two or four years shorter than the other. When the last state was admitted, Hawaii in 1959, candidates for the Senate ran either for "seat A" or "seat B". The new Senators, in a process managed by the Secretary of the Senate, drew lots to determine which of the two would join the Class 1 (whose term would end in five-and-a-half years), and which would join Class 3 (whose term would end in three-and-a-half years). Should a 51st state be admitted, it would receive senators in Classes 1 and 2, at which point all three Classes would have 34 senators. earlier senators with terms that ended in 1791, 1797, 1803, 1809, 1815, 1821, 1827, 1833, 1839, 1845, 1851, 1857, 1863, 1869, 1875, 1881, 1887, 1893, 1899, 1905, 1911, 1917, 1923, 1929, 1935, 1941, 1947, 1953, 1959, 1965, 1971, 1977, 1983, 1989, 1995, 2001, 2007, and 2013.
earlier senators with terms that ended in 1793, 1799, 1805, 1811, 1817, 1823, 1829, 1835, 1841, 1847, 1853, 1859, 1865, 1871, 1877, 1883, 1889, 1895, 1901, 1907, 1913, 1919, 1925, 1931, 1937, 1943, 1949, 1955, 1961, 1967, 1973, 1979, 1985, 1991, 1997, 2003, 2009, and 2015.
earlier senators with terms that ended in 1795, 1801, 1807, 1813, 1819, 1825, 1831, 1837, 1843, 1849, 1855, 1861, 1867, 1873, 1879, 1885, 1891, 1897, 1903, 1909, 1915, 1921, 1927, 1933, 1939, 1945, 1951, 1957, 1963, 1969, 1975, 1981, 1987, 1993, 1999, 2005, and 2011. 1 2 "The Senate and the United States Constitution". senate.gov. Retrieved October 23, 2011. 1 2 3 4 "Frequently Asked Questions about a New Congress". United States Senate. Retrieved June 11, 2013. ↑ "Senators Receive Class Assignments". Senate History. United States Senate. Retrieved January 10, 2015. ↑ "Annals of Congress". Constitution Society. Retrieved August 4, 2016. 1 2 "Journal of the Senate of the United States of America". Journal of the Senate of the United States of America, 1789-1793. Library of Congress. May 14, 1789. Retrieved June 11, 2013. ↑ Skelley, Geoffrey (May 29, 2014). "Senate Class Population Imbalance". Sabato's Crystal Ball. Retrieved May 30, 2014. ↑ Davies, Lawrence E. (July 30, 1959). "G.O.P. Wins Governorship in Hawaii's First State Vote". The New York Times. ↑ Trussell, C. P. (August 25, 1959). "Congress Hails Three New Members from 50th State". The New York Times.